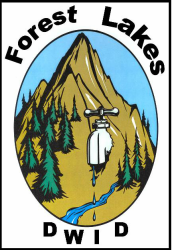 The Forest Lakes Domestic Water Improvement District (the District) was created under Arizona Revised Statutes Title 48 in 1992 by the Coconino County Board of Supervisors. This transformed the District from an improvement district owned by the County and operated by the Forest Lakes Estates Homeowner’s Association, to a political subdivision of Coconino County governed by an elected Board of Directors. The Board of Directors meet at the Water District Office the third Thursday of each month at 11 A.M. with possible Work Sessions one-hour prior. The public is invited and encouraged to attend these meetings. Please check the posting boards or call the District Office to find out if there will be a Work Session.